Turbogems is a cool gem matching game. Line up the falling blocks to make matches of 3 or more of blocks of same type. Here you are, sitting inside your spaceship, minding your own business, when all of a sudden, without any warning whatsoever, shiny gems start materializing right inside your spaceship! 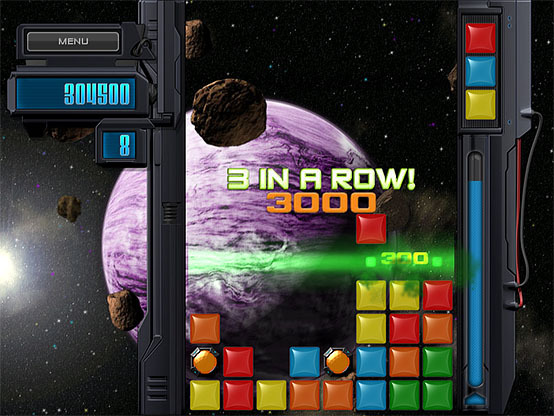 Make matches and prevent the stack of gems from filling up your spaceship, or your journey is over! Three fun game modes to choose from! Match all you want, or puzzle your way through! Pull off clever tricks to win cool trophies, or unlock titles by just beating levels. Get a chosen title displayed alongside your name, or look up the trophies you have won in the trophy room! 21 trophies to add to your collection! 36 titles waiting to be unlocked! Bubble Elements - A good Bubble game, Battle Fire, Water, Air and Earth in this high-quality bubble shooter. X-Avenger - You fly a space ship named X-Avenger equipped with the latest weapons and technology, and travel from planet to planet through wormholes and eradicate your foes the Orion invaders. Acamar Rising - A 3D space shooter where a lone fighter must defend a space station against the many threats of space, from asteroids to aliens.